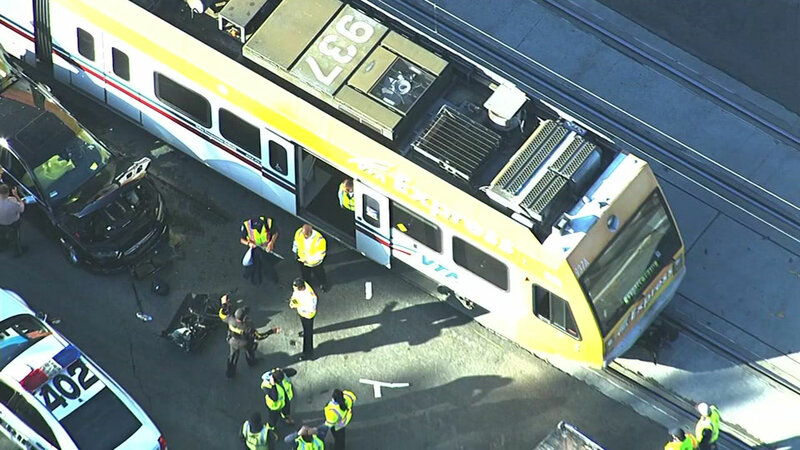 SAN JOSE, Calif. -- A Santa Clara Valley Transportation Authority light-rail vehicle collided with a car in San Jose this morning, injuring one person inside the car, a VTA spokeswoman said. The collision was reported at 7:55 a.m. in the area of North First Street and Component Drive and involved a northbound VTA light-rail vehicle and an Audi A4 sedan, VTA spokeswoman Brandi Childress said. There were 40 people inside the VTA light-rail vehicle and at least two people inside the Audi, Childress said. One person in the Audi was injured, but Childress did not yet know the extent of the injuries. No one in the VTA vehicle reported injuries, she said. The Audi was making a left turn in front of the VTA vehicle and was hit on the driver's side, according to Childress. The collision has interrupted service along the Alum Rock-Santa Teresa and Winchester-Mountain View lines, Childress said. Bus shuttles are in place between the Bonaventura and Karina stations, she said.